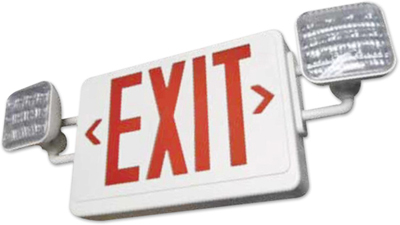 Order Exit Sign with LED lamp heads to mark egress routes in your building. • EZ-snap mounting canopy includes 2 face plates, a back plate and mounting canopy for top, end or wall installations. • Rugged, injection-molded UL94 V-0 flame retardant, high-temperature thermoplastic housing. • Long-life, 9.6V maintenance free, rechargeable NiCad battery. • UL listed 90 minute emergency run time, 24 hour recharge time with overcharge protection. • Long lasting, efficient ultra bright white LED lamp heads. 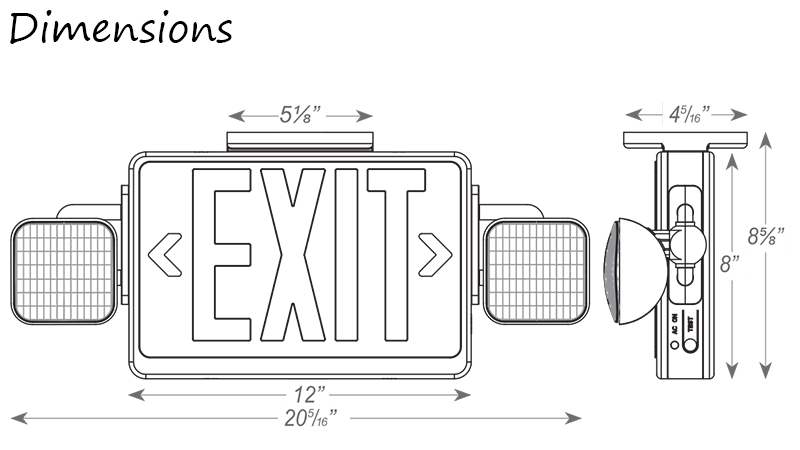 • Long-life, energy efficient Red LED exit sign illumination. • Chevron-style, universal arrow knockouts. • Adjustable LED lamp heads provide increased center-to-center spacing. • Fully-illuminated 6" characters with 3/4" stroke. • LED lamp heads are long lasting and efficient ultra bright white. Both lamp heads are easily adjustable as well. • In cases of emergency can operate LED board and lamp heads for a minimum of 90 minutes. • Functions on a dual 120/277 voltage. • NiCd battery has a 9.6V long life, is maintenance-free and rechargeable. • Includes 2 directional chevrons, back plate for wall mount and mounting canopy for top or end mount. • Meets UL924, NFPA 101 Life Safety Code, NEC, OSHA, Local and States Codes. Also is UL Listed for damp locations (0°C-40°C).